We tracked 98 M&A transactions in the Food & Beverage industry during the fourth quarter of 2018, with a median deal multiple of 9.7x EBITDA and 1.1x revenue. Restaurants and CPG Foods were the most active segments, with 23 and 22 transactions, respectively. Publicly traded EBITDA multiples over the last twelve months remained quite high at 13.7x TTM EBITDA for most of the Food & Beverage industry segments we track. While many industries rely heavily on the use of plastics, the Food & Beverage industry is particularly reliant on plastic packaging to ensure food is safe, fresh and convenient for consumers. According to the UN, the world produces approximately 400 million metric tons of plastic per year, with only 9% of it being recycled. Beginning in January of 2018, China banned the import of plastic waste from other countries, forcing many western governments, for whom it is cheaper to export the plastic overseas than it is to sort and recycle it at home, to rethink their plastic recycling programs. Furthermore, many containers composed of complex mixed plastics are difficult or impossible to recycle economically. Recent media reports about large ocean patches of floating plastic, such as the “Great Pacific Garbage Patch” (a 1.6 million square kilometer zone in the middle of the Pacific Ocean that is twice the size of Texas), have further garnered consumers’ attention on ways to make food and beverage packaging more sustainable. This increased focus on making food and beverage packaging more sustainable presents a host of challenges. Companies that can successfully innovate by making their product packaging “greener” have the opportunity to become champions of innovation in the marketplace. By offering packaging materials that are reusable, recyclable, compostable and/or biodegradable, while maintaining consumer convenience, innovative companies stand to gain dominance in the marketplace, as long as those innovations are cost effective. We tracked 116 M&A transactions in the Food and Beverage industry during the third quarter of 2018, with a median deal multiple of 16.0x EBITDA and 1.3x revenue, among transactions with reported values. 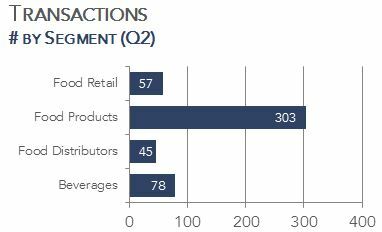 Restaurants and CPG Foods were the most active segments, with 34 and 32 transactions, respectively. Publicly traded EBITDA multiples over the last twelve months remained quite high, at 13.9x TTM EBITDA for most of the Food and Beverage industry segments we track. The GMO labeling laws are changing in the U.S. While the details and nuances are beyond the scope of this report, the impact the changes may have on the industry and the M&A market are important and warrant a close watch by industry participants. A recent study showed that seven out of 10 consumers have little idea of what GMO actually is. Voluntary labeling initiatives, such as Non-GMO Project’s certification program have added to consumer confusion, by labeling products as Non-GMO, even when there is no GMO equivalent of the product. Recently, companies like Nestle and Chipotle are facing class action lawsuits for claiming their products are non-GMO when the products contain dairy and/or meat that was raised on feed that may have contained GMO ingredients. This creates further confusion in the marketplace, when consumer expectations of labeling now include the production process rather than the product itself. Hopefully, the new labeling requirements will limit the amount of misleading claims allowed, be based on sound science, provide clear choices for consumers and reduce confusion. We tracked 88 M&A transactions in the Food and Beverage industry during the second quarter of 2018, with a median deal multiple of 12.30x EBITDA and 1.74x revenue, among transactions with reported values. Restaurants and Alcoholic Beverages were the most active segments, with 20 and 14 reported transactions, respectively. Publicly traded Enterprise Value/EBITDA multiples for the last twelve months remained quite high for most Food and Beverage segments we track, ranging from a low of 9.7x LTM EBITDA for Fine Dining to a high of 43.9x LTM EBITDA for Digitally Native, a multiple that is likely so high due to the weight many investors place on growth over profitability. CPG food companies face a daunting and never-ending challenge of increasing, or at least maintaining, the consumption of their products while tightly managing their costs to produce, market and distribute them. With the consumer looking for healthier choices that are cost-competitive, food processors need to pay close attention to their ingredient choices. Fortifying food products with natural, functional ingredients to legitimately improve nutritional and health benefits is a key strategy being employed by many of the major CPG food companies. For example, consumers can now buy cookies or pasta that contain one or more “servings” of fruits or vegetables. Sales of new naturally fortified products can potentially command a premium, or, at the very least, provide an edge in a highly competitive market. Many CPG companies are adding consumer choices by broadening product lines with “premium” brands that offer and support nutritional or health claims. According to Market Research Future, the food fortification ingredient market is expected to grow at a 4.5% CAGR through to 2022, driven by an expected continued increase in fortified food product launches by major food companies. While the major ingredient companies such as Ingredion, DSM, Cargill and ADM offer a host of solutions, many smaller players are emerging as the market demand increases and the science behind the potential health benefits evolves. Publicly traded EBITDA multiples over the last twelve months remained quite high for most of the Food and Beverage industry categories we track, led by the Digitally Native segment (companies like Grub Hub, Just Eat, etc.). 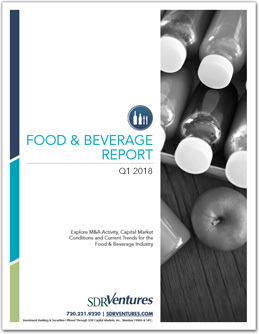 We tracked 73 M&A transactions in the Food and Beverage industry during the first quarter of 2018, with a median deal multiple of 5.9x EBITDA and 0.7x revenue, among transactions with reported values. 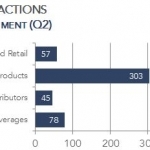 Restaurants and CPG Foods were the most active segments, with 15 transactions each. The non-alcoholic beverage market continues to evolve rapidly as consumers across the U.S. and Canada increasingly choose healthy, natural and/or functional beverages, with unique flavours and innovative packaging, over carbonated soft drinks and other traditional beverages. While most major brands have their own lines of healthy alternatives, newer emerging brands are gaining momentum through innovative marketing and promotion tailored to health-conscious consumers who are willing to pay premium prices. Some of the most successful brands seem to have effectively integrated their online marketing strategies with their retail and food service channel promotion strategies. By connecting directly with their consumers and brand ambassadors on social media platforms, brand attributes such as nutrient content, processing/production methods or health claims can be more effectively marketed. This is leading to pantry loading through online sales by loyal customers that have incorporated their favourite healthy beverage into their daily lifestyle. The Food & Beverage industry continues to rapidly adapt to ever-changing consumer expectations and demands. Industry participants need clear strategies that lower COGS and operating expenses for center-of-the-aisle products, while simultaneously looking for ways to grow market share and capture positions in growing categories. Consumers’ growing appetite for foods and beverages perceived as “better for you,” such as clean-label, local, plant-based, organic, whole and natural, are well entrenched, yet the large, diversified, packaged food & beverage companies have lagged the smaller, nimble food companies in capturing this market. This has created an interesting and highly active M&A market over the last few years, as industry participants jockey for positions and market share. The end result has been high and rising valuations, driven by the low cost of debt financing and the strong corporate balance sheets of the majors as they chase fewer quality deals. We believe that demand for middle and lower-middle market food & beverage companies that are “on-trend” and have an established track record in either retail or food service markets has never been stronger. 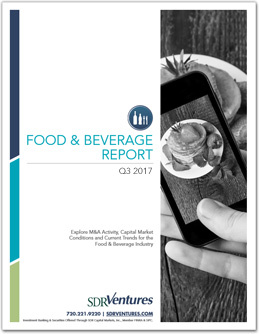 We tracked 93 transactions in the Food & Beverage industry during the fourth quarter of 2017, with a median multiple of 12.3x EBITDA (average 10.2x) and 1.4x revenue (average 2.0x). CPG Foods was the most active segment, followed by Restaurants and Alcoholic Beverages. For food & beverage companies locked into the production of staple products, cutting operating costs is an ongoing initiative. One of the more interesting technologies that we believe may hold great promise to reduce operating costs is the blockchain. While normally considered the underlying technology for cryptocurrencies, such as bitcoin, this technology has the potential to significantly lower costs throughout the food & beverage supply chain, as well as drive many consumer benefits such as food safety and traceability. Recently, IBM announced that it had formed a consortium of major retailers, including Walmart and Costco, to pilot blockchain technologies to improve food transparency, traceability and improve proficiency of food recalls, should they be required. If you read this report often, we are quite sure that you have become accustomed to the narrative that seems to repeat itself in this industry: the ground beneath our feet is shifting. In recent years, the primary driver has been the growth of consumer ideologies that go beyond the sensory experiences that products provide. This has led to massive shifts in market share away from large, established brands to new innovators. We believe that this will continue to fuel incremental change in every category, as well as affect the M&A and capital formation landscape. That said, the latest transformational development in the space was the Amazon/Whole Foods deal. However, we do not believe this development to be the underlying fuel, much in the same way that natural/organic is actually fueled by the aforementioned consumer underpinnings. 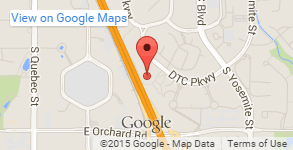 Did you hear that some ecommerce site bought a natural foods chain? If you have, then you know that people far more intelligent than us have already written about it. If not, welcome back from whatever tropical island you were stranded on – we hope you had sunscreen. Our view on the Whole Foods (“WFM”) deal is that it is awesome and important, but it is really an outcome of the true independent variable here: the modernization of supply chain in food & beverage. This concept is comprised of two things: (1) packaged food is moving online and (2) the center of the store is shrinking. In last quarter’s issue, we discussed the macroeconomic and regulatory trends that we expect to affect the industry in 2017. We also promised to share our view on micro trends, defined as (1) consumer ideologies, (2) retail trends, (3) the consumer palate and (4) innovation. To put this more succinctly, the investors and strategic buyers that we spend a lot of time speaking to have helped us shape a core thesis for 2017. Cost and convenience, according to 77% of U.S consumers, are the main purchase drivers, above all others. While we believe cost is important, anecdotal secular trends clearly point to cost being a threshold, and convenience being the consumer need story. At the core of consumer convenience are digitally native brands that bring shopping experiences and products directly to consumers through the internet. In January of 2013, monthly visits to digitally native brand sites (i.e., Birchbox, Dollar Shave Club, Blue Apron, Graze, etc.) in the U.S. totaled 720,000. In January of 2016, monthly visits reached 21.4 million. Additionally, Techonomic, a Chicago-based market research firm, estimates that direct-to-door meal kit market revenue will increase 10x, from $1 billion in 2015 to $10 billion in 2020. It would be nice if we could arrange those six items into an acronym, (CIRCER? ERCIRC? ), but that is why McKinsey wouldn’t hire us out of business school. That said, we will share below our thoughts on Macro Trends and what to expect in 2017. We will discuss our views on Micro Trends in subsequent issues, but if you want to discuss now, please feel free to ask. We are always happy to flaunt our nerdiness. The charts to the right tell us that based on three key factors (employment, hours worked and hourly earnings), Americans are making more money than ever before. When people make more money, presumably they have more disposable income to buy food, and they can invest a little in pricier items that help contribute to good health (like plant-based dairy replacements) or their enjoyment (like craft sodas or cold brew coffee). While it’s difficult to say with conviction that the American consumer has been negatively affected by political uncertainty (food and beverage, grocery and beer and wine and spirits sales all increased healthily in 2016), there are some things to track under the new administration. The new President alluded to infrastructure spend and tax cuts that, theoretically, could create more disposable income for consumers. We believe nearly every category within food and beverage is experiencing a market share overhaul like nothing we have seen before. The consumer palate has become very dynamic as millennial consumers have matured into a large piece of the economy and the purchasing power of Hispanics has tripled over the past 15 years. The new consumer is asking for more transparent, healthy, authentic and natural foods that also provide an experience (bold flavors, ethnic concepts, etc.). Thus, a new customer base has been established, making large returns possible for companies with the ability to provide innovative products. Products that provide a healthy way for consumers to add bold flavors to meals were attractive M&A candidates in Q3. ConAgra’s acquisition of Frontera and Red Fork, respectively, represented the addition of ethnic flavors, sauces and salsas to ConAgra’s consumer portfolio. B&G Foods also acquired the spices business of ACH Foods. While consumers increasingly prefer healthy products, they still want to indulge sensibly. Products that allow consumers to enjoy their favorite meals or snacks without consuming unwanted ingredients also were attractive M&A candidates. ADM acquired Caterina Foods, a leading producer of gluten-free and high-protein pastas and grains. ADM also acquired Soozie’s Doozie’s, an all-natural maker of non-GMO cookie mixes. The consumer’s delight in innovation has been rewarded many times over in the coffee category, and the latest is Silicon Valley-based Philz Coffee. The company hopes to accelerate its growth plans by taking pour-over coffee mainstream. Philz received a $45-million growth investment from TPG in October to expand geographically. The market continues to remain active, and strategic buyers that once sought stable, cash-flow generating companies with $100 million of revenue now are targeting much smaller companies. Many have taken the approach of forming investment vehicles so that they can place bets on multiple small brands as opposed to one large brand. This has caused private equity some difficulty in branded CPG food. We expect private equity to continue to invest in the sector, but perhaps in more mature, consolidated segments where they are less likely to be outbid by strategic buyers. Private label foods, however, has held its market share across all categories for several years, and Treehouse Foods remains one of the only strategic players in private label. We expect private equity activity to increase steadily in this area in coming years. We attended FoodBytes Boulder, hosted by Rabobank, in October and were impressed by the emerging food technologies and brands. Several key themes stuck out, but among the most important was food waste. The beauty of many of the companies, like Mad Agriculture (www.madagriculture.org), who is cultivating animal feed on composted food waste, or Regrained (www.regrained.com), who uses beer grain waste from the brewing process for baked goods, is that these startups are not only finding ways to recycle waste, but they have identified low cost agricultural or food processing inputs that could change the game in fighting food supply issues. In 1957, applied mathematician and UCLA marketing professor Igor Ansoff introduced a concept called the Ansoff Matrix. The Ansoff Matrix was designed to visualize the strategy in which companies formulate products to enter markets. The purpose of the matrix was to give management teams the ability to think strategically about the potential risks and returns on various growth strategies. Market Penetration Quadrant: Least risky because product and market fit already have been proven/established. Least return because the lack of risk creates a low barrier to entry, meaning lots of competition. Usually a commodity/price-driven market where players who compete on price and capitalization win. Market Development and Product Development Quadrants: Incrementally more risk and return because either the product or the channel has been proven, but not both. Incrementally more return because something special or innovative must be done to create a new product or enter a new market. The Diversification Quadrant: Riskiest because the company is not just trying to acquire market share, but it’s also trying to create a new market altogether. There is no proof that existing channels for the product even exist. The emergence of the millennial generation as a consumer base continues to shape channels in the Food & Beverage Industry. Food & Beverage has lagged behind durable goods such as electronics and appliances as consumers shift to online shopping, but the landscape is changing. Large Food & Beverage players have already invested, or plan to invest heavily, in e-commerce platforms to prepare for increased consumer demand. Food & Beverage only makes up approximately $8B of the $347B total annual e-spend. Globally, Food & Beverage is expected to reach 10% of online shopping by 2020. South Korea currently is leading the industry, with approximately 80% of shoppers buying groceries online. According to BI Intelligence, several factors will contribute to the success of online grocery shopping including: freshness, convenience, product selection, subscription-based prepared meals that are differentiated from traditional supermarket shopping, as well as increased consumer adoption of same-day delivery offerings through services like AmazonFresh. Jeffries predicts that by 2020 small brands, which were at $60B in value in 2008, or 33% of the segment, will grow to $95B, or half of the segment. Through e-commerce, many of these smaller brands will be able to connect directly with their customers through social media and online ordering platforms, reducing pressure to find shelf space through traditional channels. As consumers continue to shift toward e-commerce, smaller brands should not feel the same pressure to form partnerships with large distributors to expand their distribution footprint and will be able to distribute their products directly to their customers through third-party logistics providers. Large brands also continue to invest in e-commerce. Pepsi recently hired Gibu Thomas as General Manager of E-commerce to make sure that the company is well-positioned to preemptively address global online shopping trends. PepsiCo CEO Indra Nooyi stated at the company’s 2015 annual shareholder meeting that “e-commerce is shaping up to be the next great revolution in the food and beverage industry.” Pepsi has used Amazon as a test lab for new products before conducting a wider expansion, including its stevia-sweetened Pepsi True. Mondelez announced that e-commerce would factor into its growth strategy with a goal of $1B in direct e-commerce sales by 2020. It launched Oreo Colorfilled over the 2015 holiday season, where Oreos in personalized packaging were sold direct-to-consumer for the first time ever. 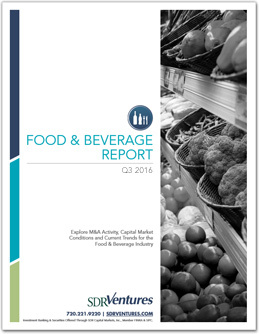 Food & Beverage M&A activity has remained strong with 194 transactions so far in 2016. Strategic and financial buyers are focused on the agility, reactivity and innovation that small companies possess. With faster innovation cycles and initiatives that match consumers’ needs, small companies are great ways for large strategic firms to acquire talent and on-trend products without long the R&D cycles traditionally needed to innovate new products. In 2015, the Food & Beverage Industry witnessed the crescendo of what SDR calls the “Conscious Consumer” movement. This movement was not new in 2015 but it became more mainstream than ever. Consumers of all demographics and income levels increasingly want to identify and connect with brands that exemplify ethics and values that mirror their own. While Food & Beverage companies still compete on price, they also are interacting with more educated and involved consumers who want local, fresh, healthy and responsibly sourced products and ingredients. On Whole Foods’ Q3 earnings call, CEO John Mackey emphasized this point, “Yes, we’re going to be competitive on price where we need to be, but, first and foremost, the Whole Foods Market brand stands for the highest quality, selection and service. We believe values matter. It’s what our customers tell us they love most about us, and we’re not changing that.” The Conscious Consumer trend should continue to establish its mainstream foothold in 2016. Conscious Consumers have a mandate for simple ingredients. A research study conducted by Hershey’s found that 68% of global consumers want to be familiar with every ingredient on the package, and 40% preferred foods with minimal ingredients. Foods bearing “free-from” labels have become increasingly important as consumers can quickly identify the label and associate it with foods that are natural or less processed. This trend has resulted in the top 25 U.S. Food & Beverage companies losing an equivalent of $17 billion in market share since 2009 according to Credit Suisse. Consumers are seeking brands that give them fewer ingredients, and large retailers such as Wal-Mart and Safeway have responded. Shelf space that was once dominated by mega brands is now being shared with brands such as Chobani, Nature’s Path and Amy’s Kitchen. Large Food & Beverage companies have responded to the Conscious Consumer trend by acquiring smaller on-trend companies with strong brands built on simple, healthy ingredients and with dedicated regional followings. Fourth quarter examples include Pinnacle Brands’ $975-million acquisition of Boulder Brands for 17.5x EBITDA and Constellation Brands’ acquisition of Ballast Point, a San Diego craft brewer with a loyal consumer base. Food & Beverage M&A activity should remain high in 2016. Input costs for the industry should remain low as spot commodity prices remain cheap, resulting in increased cash flows to large strategics enabling them to take on more debt to fund acquisitions. Private equity groups are expected to remain active as well, with capital overhang near historically high levels. 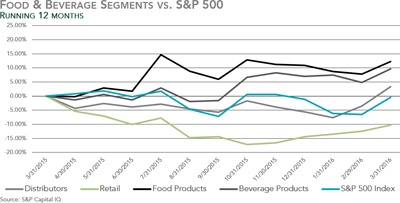 The Food and Beverage Industry continued to outperform the S&P 500 index for the third quarter of 2015. Behind this continued growth is rising consumer demand for food categories with perceived health benefits, such as natural/organic, gluten-free, high protein or non-GMO. As this niche segment faces heavy consolidation efforts domestically, many larger players are looking toward developing markets in other countries as the next healthy segment frontier. Growing demand for organic food, increasing spending habits, life quality and changing trends in demographics in Asian and African countries have provided American companies with major growth opportunities. The past four quarters of M&A activity demonstrate this growth of healthy consumer trends into Asian markets. In April 2014, WhiteWave Foods entered into a joint venture with China Mengniu Dairy Co. Ltd., the biggest dairy company in China. WhiteWave also has continued efforts to acquire smaller domestic organic-food companies throughout 2015, perhaps in preparation for expanding global demand. In Q2 and Q3 of 2015, the Company acquired Wallaby Yogurt Company, a specialty organic yogurt producer, and Sequel Naturals, a plant-based health products company, for a combined value of $675 million. Chinese consumer preferences have increasingly shifted toward Western brands over the past few years, driven by food safety issues in China such as the 2008 melamine outbreak. A perception of Western products as being safer, healthier and better quality continues to spread throughout the country. In an effort to take advantage of this trend, many Chinese players are pursuing joint ventures or acquisitions of American companies in the health-related niche categories. For example, Inner Mongolia Yili Industrial Group Co., Ltd, the second largest dairy company in China, formed a US milk powder joint venture with Dairy Farmers of America, Inc. in July 2013 in an effort to sell under an American brand. As global consumers continue to pursue healthy food choices, the Food and Beverage Industry can expect to see American mid- to small-size healthy consumer companies becoming increasingly attractive acquisition targets. The Food & Beverage industry continues to perform well as consumer confidence improves. Disposable income for consumers has been rising as the economy recovers and investment values grow. The recent drop in energy prices has also provided more discretionary income. It is expected that this will motivate consumers to be less cost sensitive, improving the environment to allow industry players to raise prices and increase sales. SDR continues to monitor activity among the bustling health-conscious Food & Beverage companies. “Perimeter” food categories and food categories with perceived health benefits, such as natural/organic, gluten-free, high protein or non-genetically modified organism are expected to exceed the growth of shelf-stable, “center-of-store” categories. Players in the Beverage industry have been experiencing decreased earnings as consumers shy away from sugar-heavy, less healthy drinks. Traditional Food & Beverage companies, such as Kellogg’s (NYSE:K) and Coca-Cola (NYSE:KO), which haven’t extensively explored perimeter food and beverage categories, have seen their incomes decrease year over year in the second quarter. The popularity of food companies with perceived health benefits also can be observed in recent transactions. More perimeter food category players, such as Applegate Farms LLC, are being acquired by bigger firms to compete in the health-conscious segment. The food & beverage industry will benefit as per capita disposable income continues to grow on the heels of the economic recovery. The U.S. economy continues to show signs of slow and steady improvement as unemployment continues to decline, the housing market rebounds and stock market prices continue to approach record highs. According to Gallup, U.S. consumers’ daily food & beverage spending increased to an average of $81 in January 2015 up from $78 in January of 2014. The food & beverage industry continued to regain its pre-recession standing in Q4 of 2014. Despite a 1.1% annual industry contraction between 2009 and 2014, rising per capita disposable income, growing number of households, and increased consumer spending are expected to boost annual growth to 0.4% between 2014 and 2019. Supermarkets saw their market share rise to 91% of the $760 billion US food retail market as consumers cut back on spending by dining out less. Pepsi and Coke continue to dominate the beverage market with estimated 2014 revenue of $16.1 billion and $14.8 billion respectively. Because of their size, product offerings, and distribution network, larger firms such as Coke and Pepsi are able to enjoy net profit margins above the industry average of 3.5%. The food & beverage industry is at a mature phase in its industry life cycle and is projected to grow slower than the overall economy. However, within the industry, established name brands will continue to adapt to meet the demands of health-conscious consumers. The organic food market continues to witness double-digit growth and is widening in all food categories. Health conscious M&A and capital raising activity in Q4 included companies such as Good Karma Foods, Inc; Lola Granola Bar Corporation; Suja Juice Inc; and Wholesome Valley Foods. Operators in the middle market are attractive to large industry players looking to make strategic acquisitions to expand their product base to include local, craft, and specialized items. Increasing economic indicators – including personal income, consumer price index for food, and retail sales suggest that the food & beverage industry had a strong 3rd quarter. US personal income, a key driver of spending at restaurants and bars, rose 4.3% in July 2014 as compared to July 2013. The consumer price index for food, an indicator of food product values, rose 2.7% in August 2014 compared to the same month in 2013. US retail sales for food services and drinking places increased 4.9% in the first eight months of 2014 compared to the same period in 2013. Finally, the US economy added 599,000 jobs in Q3 2014, a probable indicator of restaurant industry growth according to the National Restaurant Association. The quality and quantity of household food and beverage consumption are influenced by disposable income. Service providers, such as bars, cafes, coffee shops and restaurants are significantly more elastic to that input than most businesses, denoting that the industry’s thin margins have been experiencing gains on the heels of the US’s economic recovery and subsequent spending increases. With relatively higher cash than normal – and managers who are hedging against another economic fallout – two broad consolidation tactics have been in play, with no exception to this past quarter. One is the consolidation of luxury and common goods, the other is the consolidation of the vast number of small, specialized operators; interestingly, these two plays work in tandem. Craft beers, for example, command high profit margins as the demand for flavor profile has eroded market share of the major brewers. Distribution, however, prevents microbrewers from expanding their footprint at a substantial level. Thus, the consolidation plays are driving efficiency into the industry. M&A activity in this industry is off to a great start in 1H 2014, posting about a 10% gain in deal volume over last year and a nearly 25% gain in capital invested. Value-added products and services, particularly those that emphasize flavor profile, health and wellness, should continue to command the highest trading multiples as the industry maintains its consolidation trend. 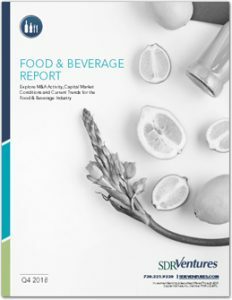 If you’d like to receive our next Food & Beverage Report by email, please click here and select “Food & Beverage Report” from the list.